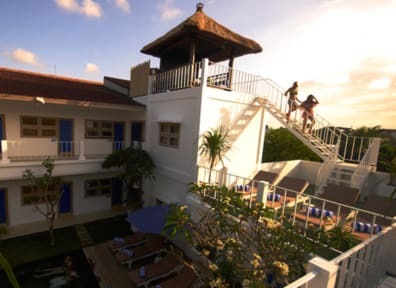 The Island Hotel was designed to provide a boutique hostel experience for the independent and budget traveller. On Bali the best ideas from the East and West readily come together, and The Island is no exception. Here we have tried to combine eastern philosophy with western hotel standards to create the perfect base for your Indonesian adventures. We also have the Island Cafe (Wood fire pizzas, Italian Coffee & Healthy Alternatives) , Infinity Pool, , Free WiFi Internet, Travel Desk and of course a super friendly vibe. Checked in around am after our flight in- was impressed with our few hours there. Had a private room at the pool and was nice to relax after a long flight. Breakfast was wonderful and staff was great. Would stay again, in fact we almost went back! i love the location its not too busy. the atmosphere is calm with a tower to look over the sunrise. you don't hear too much of the traffic noise. the staffs are friendly and the owner is super nice and helpful. Great staff that were super helpful to me for recommendations. Even lent me some sandals when my shoes were wet! Loved the pool and tower. Liked that it was on a hidden side street as I got to meet some locals. Our room was fine with good aircon, pool was nice and good views from the tower of the surrounding area. Free towels with a 3+ night stay and they made the beds up each day. It was quiet at night, off the main street area, but close to everything. Bit of a walk to the beach through confusing alleyways, but not too far. I’d stay here again. The pizza oven wasn’t working though, and the side door wasn’t really super secure, so make sure to lock your room and put valuables in the locker. Room was clean but the bathroom looked very grimey. The pool area was very peaceful and a great social place. Didn’t see many others during our stay. Staff were very grumpy and acted very reluctant to help when we needed our water bottles refilling. The food here is good and reasonable priced. Other reviews mention the location being a problem down the small side streets but it was nice to be away from the busy roads. A very picturesque and short walk to the beach. Mediocre hostel. Fairly quiet (low season, to be fair). A little tricky to find the fist time and not accessible by car, only motorbike. Bathrooms very basic. Friendly and helpful staff, locker was broken when I first arrived but they stored my valuables in the office until they fixed it. Very nice pool, though. Courtyard area and staff were nice but that was about it. The rooms didn’t lock, the lockers were small, the bathroom was dirty, the sink was mouldy and there was no hot water. The communal showers were even worse with dirty walls, floors and ceilings. No towels provided. Location was 20 min walk from beach but down back alleys that got dark at night with rats and barking dogs, easy to get lost in. Hostel offered free pizza to leave a good review, hence why it has such a high rating. I’ve stayed in many hostels and this was one of the dirtiest. The bathroom was unspeakably gross with cockroaches crawling around at night. The door to my dorm room did not lock and my locker could be unlocked by any key (I tested them). The pump to the pool was broken, which I understand was probably unavoidable, but the resulting scum in the pool added an extra layer of horrible onto my stay. The breakfast staff were very rude and the hostel is located down a small alley so taxis cannot drive.